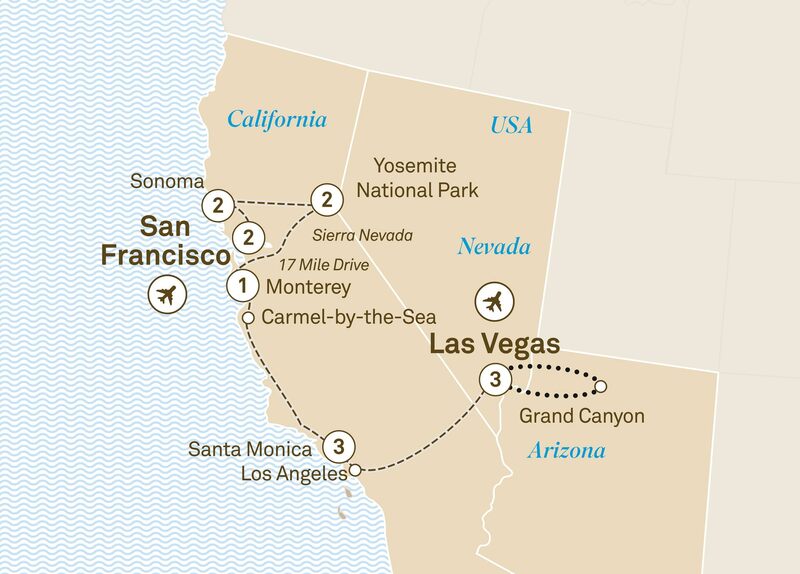 From San Francisco to Las Vegas, explore the California coast in 5 star luxury. Stop at Napa Valley & explore the world-renowned Yosemite National Park. Wonders come in all forms, as this exciting itinerary along the West Coast of the USA illustrates perfectly. From Yosemite National Park, with its pristine natural features, to the Grand Canyon, a phenomenon of such scale, it is simply beyond articulation. On this journey you can also look forward to encountering some of the most impressive wonders ever devised or created by man. From the excitement that is Las Vegas, with its bright lights and sparkle, to the cultural idylls of Los Angeles and San Francisco, which have played such landmark roles in today’s culture, you’ll be transported from one magnificent location to another. Welcome to a land that was built on wonder, and that’s been building new wonders ever since. It’s time for a fond farewell after a wonderful journey.